Smart and Stunning Female Engineers – There is strength and value in being smart and stunning! Female Engineers are simply Smart and Stunning! Author Ngowari DiminasPosted on March 15, 2017 March 17, 2017 Tags Engineering, Engineering events and seminars, Female Engineers, Pipelines, Professional Motivation, SPELeave a comment on Female Engineers are simply Smart and Stunning! Edidiong Okon Doctoral Researcher/Research Assistant, School of Engineering, Robert Gordon University, Aberdeen, United Kingdom. She recently completed her PhD program with a first class in Chemical Engineering on the work titled “Preparation, Characterization and Carrier Gas Transport Characteristics of Inorganic and Organic Membranes for Application in Lactic cid Esterification with Ethanol”. She is a native of Nist Atai Local Government Area, Akwa Ibom State, Nigeria. How did your journey to study Engineering begin? What inspired you initially? I graduated with a BSc in Chemistry from the Department of Chemistry University of Uyo in 2011 with a second class upper division (2.1). During my National Youth Service Corps (NYSC) in Nigeria after my under graduate degree, I taught chemistry course and basic sciences in secondary school before I started my masters degree. During this period, I get to express the knowledge and experience that I acquired to the young pupils. This was to encourage the pupils especially the young females in the secondary school. However, it was also a source of encouragement to most of my female corps friends. Also, during my BSc course, I was always competing with the male students in my class and this led to my graduation with a second-class upper division in Chemistry. In the first one and the half year of my PhD in Chemical Engineering, I performed a lot of research assistant work in the laboratory such as gas separation transport test with membranes for different applications. I have used membranes and catalysts to produce Ethyl lactate solvent from lactic and ethanol, waste water treatment, biofuel production, single and binary gas separations. I also contributed to my colleagues in the Research Centre as well as supervising BSc, BEng, Meng and MSc students in their project work which was a source of encouragement to a lot of female students in the school of Engineering in my University who were aiming to start a PhD program in Engineering. As a female research student in School of Engineering, I attended and made several presentations at international conferences including world congress on engineering and computer science (WCECS 2015) and 3rd international conference in mechanical and Aerospace (Mechaero 2015) San Francisco, United states of America, where I won the best student paper awards at both conferences. This has also served as an encouragement to a lot of women in my field. What does your family feel about your profession? My family is happy and proud of my profession. The motivation in my research work was to address an existing thermodynamic equilibrium problem in the chemical industry in the choice of suitable catalysts and membranes for the production of ethyl lactate. Ethyl lactate is used as a commercially available solvent used in different industries. This solvent can replace a lot of hazardous petrochemical solvents being used currently including toluene, benzene, and xylene. As such there is need for solving the equilibrium problems to obtain a higher conversion of this solvent. The conventional method for producing ethyl lactate is by the esterification of lactic acid with ethanol catalysed by homogeneous catalysts such as sulphuric acid. However, the use of homogeneous acid catalysts causes a lot of problems including acid contamination of the ester product. Aside from thermodynamic equilibrium limitation problems, reaction yield can also be limited by other factors such as mass transfer and heat that is generated during the esterification process. These limitations can be overcome by altering the reaction design. The motivation of research was to produce ethyl lactate by process intensification using membrane for higher yield of the solvent. In this case what the membrane does is to selectively shift the chemical equilibrium to the product side for higher conversion. The essence of using catalysts and membrane is to compare the efficiency of the two methods and evaluate the most effective method for the production of ethyl lactate, which will be recommended to the different industries such as food, petrochemical, pharmaceutical and agricultural industries that employed ethyl lactate in my home country. Also, my motivation in teaching is to transfer the knowledge that I have acquired to the young generation especially the female students which will encourage them to aspiring as woman in engineering to the development of my home country. What do you wish you could have done better? What advice would you give your younger self and why? I would love to research more in my field (catalysis) if given enough time. Work hard to accomplished the set goal. Provide a personal quote to motivate others. Keys to succeed in Engineering field: Determination, Commitment and Persistence and Self confident. CAFEW is happy to celebrate, encourage, and motivate Female Engineers and other Females who enable success in Engineering. Cervical Cancer by Chisa Echendu, MD, Ph.D.
As part of the CAFEW Wellness Wednesday, the need to discuss various health issues females face is crucial in order to support one another to consciously create awareness regularly. Our general healthy wellbeing is important so we all need to work hard towards understanding various causes of diseases and path to prevention. Dr. Chisa has been very instrumental to providing tips on Cervical Cancer on the CAFEW facebook page as well as share links, articles and other information pertaining to this disease. There are so many articles about her online for more details of her work and passion. She recently gave a presentation at the Women’s Health Summit, 2018 and I got her permission to share her slides. Questions are welcome in the comments section and we will be happy to answer them accordingly. From Left to Right: Dr. Chisa Echendu and Ngowari Diminas at an event in Houston, TX. 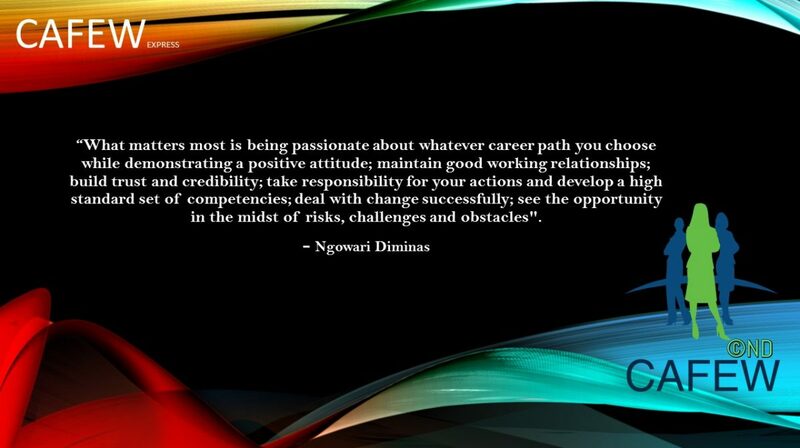 Author Ngowari DiminasPosted on May 9, 2018 1 Comment on Cervical Cancer by Chisa Echendu, MD, Ph.D.
Nigerian Society of Engineers (NSE) Houston Branch Inauguration. The Nigerian Society of Engineers (NSE) was founded on February 16th, 1958. Its objective is to promote the advancement of engineering education, research, and practice in all its ramifications thereby maintaining and enhancing the professional capabilities of its members so as to better equip them to fulfill the needs of the profession for the good of the public and the nation of large. For further reading, it is best to refer to the link below for the history of NSE. The inauguration of the Houston Branch was held on May 3rd, 2018 at the Texas Southern University (TSU) Houston, Texas. “On behalf of Council and entire membership of the Nigerian Society of Engineers (NSE), I am indeed, very delighted to stand before you today to perform the official inauguration of NSE Houston Branch which has brought our Branch network strength to 72. Houston Branch is the first Branch to be inaugurated outside the shores of Nigeria but the second International Branch to be established by the Council after London Branch as the 71st Branch of NSE. The Inauguration of Executive Committee members and the induction of the new members was done. The Exco members are ready to serve and be committed. The NSE Houston Branch Chairman also gave his speech and there were several short speeches and good will messages including Dr. David Olowokere, Engineering Department, Chair, TSU and the President of National Society of Black Engineers (NSBE) TSU Chapter. The cutting of the NSE 60th Anniversary Cake was performed with the support of the other Exco members that came from Nigeria to witness this occasion. As part of the CAFEW Social Engineering Series; I interviewed the NSE President, NSE Vice President and the NSE Chairman Houston Branch. The full interview can be accessed via the link below. Picture below was taken after the CAFEW interview. From Left to Right: Engr. Fisoye Delano; Ngowari Diminas; Engr. Adekunle Mokuolu, FNSE; Engr. Babagana Mohammed, FNSE. There was lots of networking and conversation with various colleagues, friends and well wishers. From Left to Right: Ibiere Minimah Jumbo, Myself, Stephanie Nwoko, Samuel Ighalo, Myself and Bralade Emenanjo. Myself and Bralade are the CAFEW presenters and we have been working together to build questions, technical topics, dialogues and areas that are key to supporting women in Engineering. Author Ngowari DiminasPosted on May 8, 2018 Leave a comment on Nigerian Society of Engineers (NSE) Houston Branch Inauguration. My journey into engineering was clear cut from my quest of wanting to know more. I kept asking how electricity was generated. My inspiration came from one of my uncles who is an Electrical Engineer with me consistently asking how he does wiring and never gets a shock. I also wanted to show off that I could hold an electrical wire with a tester placed on any part of my body and the tester glow. It was really important because I wanted to know how that happens. My family feels great and proud of me. When I was a lot younger, my father would boast to his friend that I just figured out the electrical fault in the house and mention that there is light in the house courtesy of me. Once I got married, my husband understood my passion and has been very supportive. He encouraged me to further my study in a different Country other than ours in order to get more experience working and thriving in an international environment. Are you a member of the CAFEW Facebook group? If so, for how long and active are you in the group? Yes, I am but I must confess that I am not active. How has CAFEW contributed positively to your social and professional life? Please advise on areas of improvement. I have read inspirational stories of women of exploit on CAFEW facebook group page and I must say that it has contributed positively to making me want to aim higher. What were your challenges in securing a job? What tips do you have to encourage others in job search? I did not have much challenging securing a job as a fresh graduate. I got myself busy in my local church as it was a big one. The church always had the need to replaces various items which includes but not limited to fluorescent tube choke, starter, servicing the fans, wires for new extension and I was there to provide that service. At the same time, I was doing all it took by applying for jobs online using my skills as search criteria which gave me an edge and I got one in no time with a telecom firm as a switch Engineer. How best would you suggest young Female Engineers navigate their careers? With great confidence and esteem, you are not inferior. Hard work and perseverance gets you there. How did you deal with the technical knowledge disparity that happens amongst females in engineering roles? For me disparity was as a result of lack of hard work and confidence and with that as my foundation, I scaled through as so many others. What currently motivates you in your recent job? My current job motivates me a lot because am ensuring a narrowing of the digital divide and a brain gain for our digital natives. What does work life balance mean to you? I know what it means being able to balance work and other life expectation like family, leisure and play well but I am not doing so well with this but and learning to balance them as that is what would bring stability to the center. What are your expectations on the evolution of Engineering in the near future? I know this cannot be overemphasized. I really do not think I can imagine it because technology is evolving faster than I imagined but we are trying to ensure our community is not so far behind. I wish I had acquired more skills especially while working I would have not relented learning more. Your current place or job is a passage so do not act as if that is your destination. I believe I would have achieved better now if I had put in a little more effort. Your shadow determines the light in you. Traveling for work or fun is an amazing experience that keeps me going. Napa Valley is located north of San Pablo in California. As soon as I arrived this beautiful place, I knew I would enjoy the environment. My trip was for 5days and I just had to make the best out of it. I had the opportunity in between to tour around San Francisco (http://techativeng.com/2018/01/18/trip-around-san-francisco-ngowari-diminas/). You can see this lovely photo of myself and the bride. One of my best photos taken at the wedding ceremony. My friend was getting married and I was excited with all the travel plans coming to reality. I met up with friends on the first night and we started out by talking about old times. The sunny day encouraged us to have more fun during rehearsals for the wedding. The bridal shower was mega fun!!! We had a good laugh. On that beautiful day, the bride gave us the challenge coin and other gifts as appreciation for encouragement. This coin is usually given to a battalion by their commander as a symbol of encouragement and support while getting ready for the big day!!! The bride is an Engineer and of course I am always proud of Female Engineers all over the world. We all enjoyed chatting, taking pictures, making up, getting selfies, updating our social media accounts…lol…It was awesome!!!! The Iconic Grape Crusher Statue!! !The statue is approximately 20ft tall. You can simply see the beauty of Art & Engineering display such a magnificent attraction. The bridal party took pictures at the top of the hill close to the iconic grape crusher statue. The pictures were breathtaking and it was just awesome to view some parts of the town from the top. Everyone is looking so classy and beautiful! My sister and friends had the time to stop by the popular Napa Valley sign. After that, they went to do a tour at the wonderful Castello di Amarosa, which means ” Castle of Love”. There was so much money and time spent on building this tourist attraction. Unfortunately, I could not make it to this amazing Castle but I have put it down on my to-do list in the future. Personally, it was refreshing for me to visit such a place and to top it with attending a wonderful wedding is truly amazing! I hope you all enjoyed the photos and brief description of what to do when in Napa Valley!! The Golden Driller Statue stands approx. 76ft tall in front of the Tulsa Expo Center since the 1966 International Petroleum Exposition in Tulsa, Oklahoma. This was initially built in 1952 and adopted as a state monument in 1979 by the Oklahoma Legislature. I took a picture of the plaque which clearly states that it is “dedicated to the men of the Petroleum Industry who by their vision and daring have created from God’s Abundance a better life for mankind”. I was so happy to read how this amazing structure was built and to see it is even more exciting. I always appreciate the beauty of Art and Engineering. The structural design put into this statue in order to withstand all kinds of weather especially tornadoes. The statue rests his hand on an originally built derrick made of steel and concrete. This statue was given a thorough inspection in 2011 and was also coated with a new layer of mustard paint that will last longer.